LG announced upcoming mobile device in chocolate series ,LG BL40 Chocolate 4 . LG chocolate phones are renowned for extravagant design and looks . The first chocolate was an award winner for its design .New Chocolate also looks glossy and stylish in appearance and adapts design elements of its predecessors . 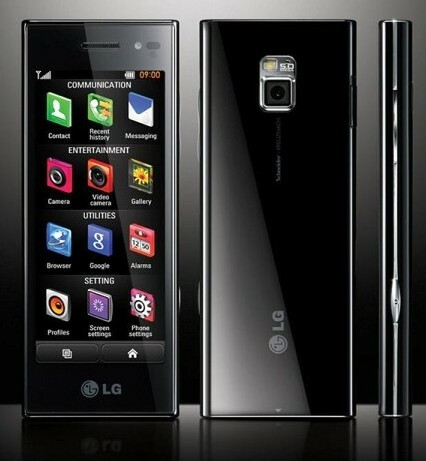 LG revamped and improved the features of the device to compete with the challenges of current scenario . LG BL40 Chocolate 4 specifications includes 5 mega pixel autofocus camera and exceptionally new 4.0 inch screen with dual screen user interface .The official launch date in India and 55 other countries will we on Q3 of of this year .Price and other details are yet to be announced . LG BL40 Chocolate 4 photos revealed by LG . LG BL40 Chocolate is the fourth phone in LG black label series .The high definition 4 inch screen with 21:9 aspect ratio will provide 800 * 345 pixel resolution . There is a dual screen UI in LG BL40 Chocolate that lets you to watch two different content on same screen at same time .This phone will be powered by a full touch screen , and there will be a virtual keypad on screen for inputs .WiFi ,GPS ,Bluetooth and all other normal features are also available . New Chocolate phone will be available by November of this year in an expected price range of 20-25 K INR in India or 500-600 USD . 4.0 inch 345 x 800 pixels TFT capacitive touch screen with support for 16M colors .New LG S-Class user interface and accelerometer support . 5 MP camera of LG BL40 Chocolate comes with Schneider-Kreuznach optics, autofocus and LED flash This camera produces still images 2560 x 1920 pixels and videos at 30fps on MP4 format . 1.1 GB internal memory expandable upto 32Gb . GPS ,WLAN ,TV-out ,Full HTML browser ,DivX support ,GPS ,3D image gallery,Document reader ,FM radio and FM transmitter ,EDGE ,3G ,GPRS ,Bluetooth and 1000 mAh battery . Available in elegant black color . Update : New LG BL20 chocolate mobile phone released . LG New chocolate BL40 is an addition in the LG’s new series. It has TFT display and has a 256 color screen thus showing a very high quality picture. This handst is mostly used by professional and young people. looks elegant. nothing has been mentioned 3g/gprs data speed. does it has floating menu? what is price of lg bl40 in india? areeeee tell me the price of bl 40 plssssssssss. now the price is dropped and it is in b/w 22000 to 23000. It is decent phone and is being made to full fill the need of young generation. I don’t liked it at all but one this is sure it will boost the sale of bl 20v as people will compare functions and prices of these phones. Wuz dis posted in 2010??? This Mobile Is Generated By “LG” It Is A Good Featured Mobile Phone With Beautiful Look. I Have Seen It By Myself In “Croma Showroom” Which Is In Canaught Place Under Odeon Cinema. I Will Say It Can Beat To Apple iphone Soon. Why phone is completely discontinued? Please tell me. Will it not be available anywhere coz its my dream phone.